First of all, detective Chesterton Holte is a ghost, and only newspaper reporter Poppy Thornton can see or hear him⏤aside from her Aunt Jo’s old dog and the cat. And the only reason he’s haunting her is because he directly led to her father being executed as a spy during World War I and this is his way of making it up to her. The year is 1924 and the country is still reeling not only from the war, but from the millions of lives lost to the Spanish Flu. Women are taking jobs usually considered the male prerogative and Poppea Thornton is one of them. She is a budding newspaper reporter, up to now assigned to the society pages as she is one of Philadelphia’s upper crust. But when one of society’s own is murdered, Poppy, to her satisfaction, receives the job of reporting the news. 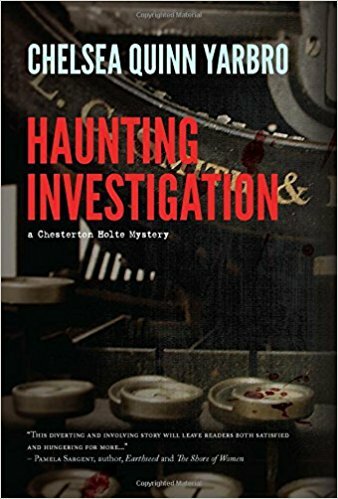 In her duties, she meets a handsome police detective, which serves her well when she becomes the murderer’s target, but it is the ghost, Chesterton Holte, who helps Poppy root out the clues. Against a whole lot of opposition, Poppy works hard and diligently to make her way in a man’s world. I liked the characters. I formed good pictures of Aunt Jo, cousin Stacy, the widow, and all the others. The setting is well done. I enjoyed the descriptions of the cars, the attire of the day, and especially, the food and drink⏤lots of drink. And during prohibition, too, wink, wink. However, the murder methods seemed odd to me. Also, there didn’t seem to be any real resolution to the story, ending more with a whimper than a bang. Even so, I enjoyed the journey with Poppy and Holte and Detective Loring. One assumes it is to be continued. Reviewed by Carol Crigger, October 2016. Author of Three Seconds to Thunder and Four Furlongs.